Former South Carolina defensive lineman Jadeveon Clowney takes part in the broad jump during the 2014 NFL Combine. The first pick of this year’s NFL Draft, Jadeveon Clowney, is a defensive end, and his selection marks the first time since 2006 that a defensive player was taken No. 1 overall. But does that mean teams put more emphasis on defensive prospects as a whole this year? And while we’re at it, how much did they invest in each position? We can begin to answer these questions by looking at how many Jimmy Johnson draft-value-chart points teams devoted to each position (3,000 points for the top pick, 2,600 for the second, etc.). 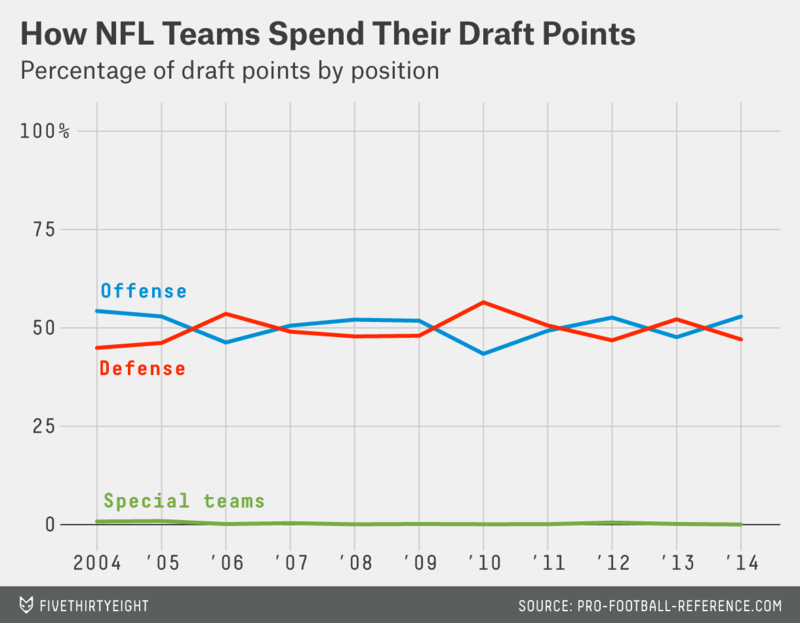 “The Chart,” as it’s affectionately known in NFL circles, isn’t a very good gauge of the relative value of each draft spot, but that’s mainly because NFL general managers tend to overvalue the right to pick early. Research on draft-day trades has shown The Chart does a great job of describing how valuable teams perceive each slot to be, which is a more relevant shade of meaning for our questions anyway. As it turns out, while Clowney and the 3,000 draft points the Houston Texans spent on him were a feather in the cap for defense, teams spent the majority of their draft points on the other side of the ball this year. Specifically, they used 52.9 percent of points on players listed at offensive positions, 47.1 percent on defenders and 0.03 percent (21.1 draft points) on punters and kickers. Positionally, you might think this was a big year for defensive linemen, given Clowney’s top billing. But overall, defensive linemen received only 17.7 percent of all draft points, 3 percent below the position’s overall 2004 to 2014 average of 20.7 percent. (Meanwhile, their counterparts on the offensive line were up 3.4 percentage points to 20.5 percent.) Quarterbacks were also down 1.8 percent compared to their long-term average, and running backs had a 3.9 percent shortfall. 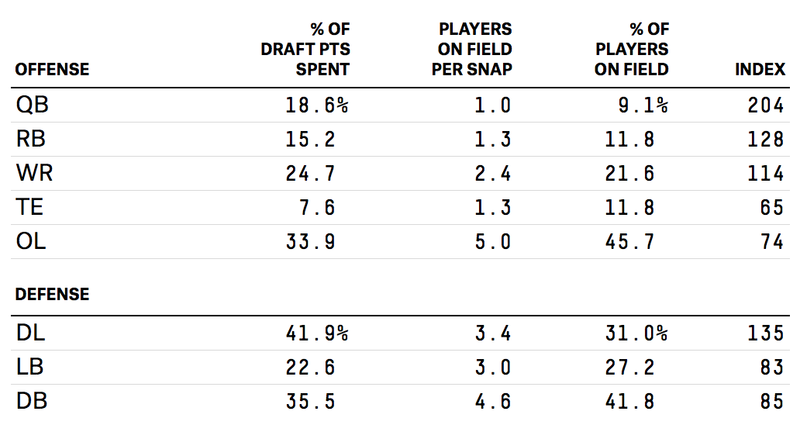 The big winners of this year’s draft, then, appear to be pass-catchers: Teams spent 3.5 percent more on wide receivers and 1.3 percent more on tight ends than those positions’ usual distribution. These long-term percentages can also give us an idea of how general managers tend to value positions relative to one another, but we need to adjust for how many players in each position are typically on the field at any given time — something we can do thanks to Pro Football Focus’s snap counts. Armed with that data, I computed an “index” of how important teams seem to consider a given position (given the amount of draft investment in it) relative to the average player on the same side of the ball. Teams spent 15.2 percent of their points on running backs over the past decade, despite running backs only making up, on average, 1.3 of the 11 offensive players (11.8 percent) on the field for any given snap. 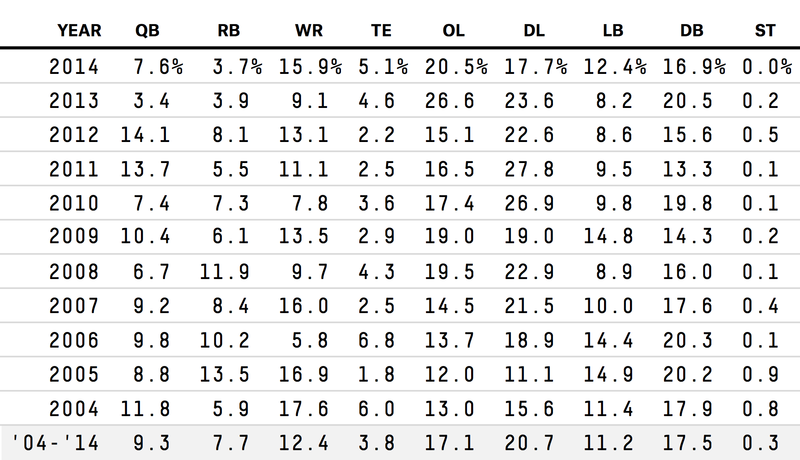 Running backs have an index of 128, then — meaning teams used 28 percent more draft points on them than we’d expect. This metric is far from perfect — the draft is a fundamentally forward-looking endeavor, while the snap counts are retrospective and track an entirely different set of players — but it provides a good reference point when comparing this year’s draft to the long-term valuation of each position.